Blurb: After 18 years, C-Tec returns to reissue two of the underground industrial scene’s most iconic albums, with a few hints of what may yet come from the legendary group. This writer missed C-Tec the first time around, so when it was announced that the band would be performing at this year’s ColdWaves events, as well as a tour with Chemlab, it was given a great deal of attention from scene news outlets. After that, this writer began to dig a bit more into the band. C-Tec originally started off in 1995 under the moniker of Cyber-Tec Project, with Jean-Luc De Meyer of Front 242 heading up the vocals, with Jonathan Sharp of New Mind and Ged Denton of Crisis NTI writing and producing the music. After the release of the first self0-titled album, or Let Your Body Die as it was known in the U.S., Sharp left the band to be replaced by Cubanate front man Marc Heal. To give some historical context, the band’s second album Darker came out in 1997. The year before this was a big one for industrial/rock with the release of Antichrist Superstar by Marilyn Manson, Stabbing Westward’s Wither, Blister, Burn and Peel, Chemlab’s East Side Militia, Barbarossa by Heal’s own band Cubanate, Gravity Kills’ self-titled debut, and Skinny Puppy’s most rock-oriented album, The Process. 1997 was then a landmark year for electronic dance music with releases from the likes of The Prodigy, The Chemical Brothers, The Crystal Method, and Fluke. Even David Bowie chimed in during that time period, with his industrial-tinged 1. Outside and drum & bass inspired Earthling. 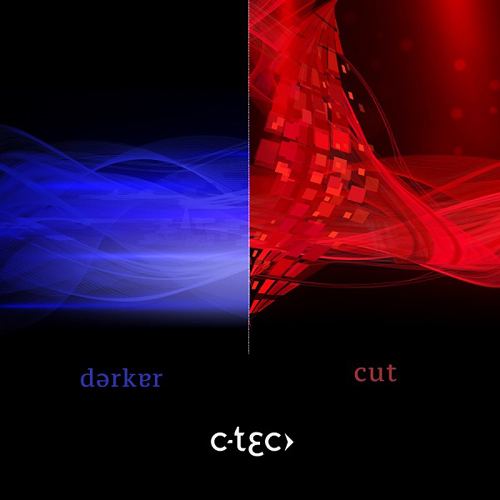 C-Tec’s Darker also straddles the line between these two forms of electronic music. It has De Meyer’s vocals, which are a hallmark of ‘80s era industrial, as well as Heal’s own chainsaw of a voice, and blasts of heavily processed guitars. On the other side, it is filled to the brim with the breakbeat style that was so prevalent at the time, and which Heal had explored on the last Cubanate album, Interference, released the following year. Darker felt more experimental than the next album, Cut, which seems to shift musical styles more, as well as a greater employment of empty space throughout the album. It has more pronounced elements of Heal’s work in Cubanate, as well as Denton’s work in Crisis NTI, and De Meyer’s vocals are more subdued than most of this work in Front 242 while still being very recognizable. This may have been done to help counterbalance the acute aggressiveness of Heal’s backing vocals. The opening track, “Random” doesn’t come out guns blazing; instead, it starts off with the complex drum patterns this album has become known for and lets that be the main focus for the first minute as the other instruments gradually appear, eventually piling on everything toward the end of the song. As with some of the elements on this album, the guitar sounds have not aged well, processed to the point where they sound more artificial than genuine, having a tinny, overly compressed quality. “Flowing” is a bit more of the same, letting the musical elements build up for over a minute before the song really gets going. The guitars sound a bit more natural and the band seems to have a good sense of when to build up the sound or drop it down with just a few elements in play. The most popular song on the album, “Foetal” goes all in with more drum loops layered in, more of Heal’s background vocals, and just an overall louder, fuller sound than the rest of the album. The song is a classic, but it does suffer from a bit of overproduction. The many layers of drums don’t always mix well with quite a few of them just sticking out and feeling almost offbeat. “Silent Voices” is the most experimental song on either album, carried almost entirely by De Meyer’s vocals with only minimal swells of synths and other sounds from Heal and Denton in the background; it is mainly a showcase of De Meyer, proving that he is capable of being a great singer without the all of the genre trappings. The song then naturally leads into “Being Nothing,” which similarly starts off with low vocals centering around a single complex drum break as the rest of the track steadily builds from there. This may be the best produced song on the album as all of the elements work together, nothing sounding dated, and finding a balance between minimalism and outright aggression, the track pummeling you with beats. “The Lost” is a bit different as it leans more heavily on synths and atmosphere than percussion, possessing a bit of a pop feel to become one of the catchiest songs on Darker, despite not having a chorus. There isn’t much to say about “Stateless,” which is a perfectly fine song, although it simply doesn’t stick out among the other tracks. “Shift IV” sounds like it could have come from Cubanate, relying heavily on drum & bass rhythms, a heavy kick drum, and blasts of guitars. It bears some similarities to “Foetus,” although slightly mixed better this time around. Unfortunately, the vocals aren’t as memorable as De Meyer sounds very subdued and filtered, which isn’t enough to diminish the track’s power. Finishing the original album off on a high note, “Epitaph” is a proto-futurepop song, sounding very much like the music VNV Nation would be making a few years after this. It has a slow buildup to uplifting synths and lyrics that were taken from a Dorothy Parker poem of the same name. De Meyer really lets loose, singing in a higher register than normal and pulling it off quite well. The 2018 reissue adds the previously unreleased “My Unbreakable Code,” a slow burn whose synths borrow a page out of the Gary Numan playbook, not unlike Heal’s current solo work. The vocals have a different feel to them than the rest of the album as De Meyer’s voice has a growl that he did not use on the rest of the album. The background vocals are different as well, as if Heal used a much tamer voice that, once again, sounds similar to those from his solo album Adult Fiction. It’s a welcome bonus track, although its 2018 production does stick out like a sore thumb against the grain of the original 1997 album, with “Epitaph” still the better choice for a closer. These criticisms shouldn’t lead anyone into thinking this is a bad or even an average album; on the contrary, Darker is fantastic, flaws and all. The album is more listenable than much of its authors’ other works, with consistently good songs, and while a lot of the sounds are firmly of their time, most of it holds up well and would still be difficult to orchestrate today. Cut came out three years later in 2000. Cubanate had called it quits just a year earlier, big beat electronic dance music was dying out, and futurepop was starting to rise in the industrial world. WaxTrax! had paid the band members for Cut, but the parent company TVT Records didn’t actually release the album, leaving the band to fend for itself. Cut didn’t see a U.S. release until this reissue, 18 years later. As previously stated, for better or worse, Cut has a more consistent sound than Darker. It eases up on the percussive layers and goes more aggressive with the rest of its sound design. The album opens with “Brutal,” and right away, the difference in sound quality is quite apparent. Nothing sounds dated and there is a more polished and balanced feel to the mix as it doesn’t feel as crowded as it did in parts of Darker. Instead, “Brutal” sticks with one complex pattern along with some nice buzzy bass synths for its duration, and while the guitar is still processed, the quality of the recording sounds much better. “I Die Tomorrow” follows, and it shares many of the same qualities as the previous track with a single heavy drum sound and distorted bass synths, but it trades out the guitar for a synth melody that gives the song its hook and doesn’t sound far off from later period Front Line Assembly. “Gesellshaft” is an EBM stomper with a clean four-on-the-floor rhythm and pulsing bassline. While the song doesn’t have a melodic hook, production touches like the faint synths fading in and out, sounds swooping through always engage and give the listener something interesting to hear. Then we come to “She Left,” which is unique in C-Tec’s catalog; lyrically, it is the most personal track on either album. Most of De Meyer’s lyrics are about more abstract, spiritual ideas, but “She Left” is more personal with the repeated phrase “I’ll be fine soon.” The song is slower and has a different, more genuine pop feel, like it could have come from a French new wave band in the ‘80s, but it too bears more than a passing resemblance to Heal’s Adult Fiction, albeit with a slightly harder edge that lets you know it’s still C-Tec. “Stormtrigger” is meant to be played on the dancefloor with a driving beat and catchy, if not repetitive synth line. The song is set up with a chorus and verse structure, but the melodic parts don’t actually change; only the lyrics, along with an extra layer added to the drums. It’s also the first track on Cut on which Heal’s vocals actually cut through the sound even when he’s mixed into the background. “Fighter” leads with a hip-hop style break and has more of a head-nodding feel to it, although the song never really picks up and is one of the less memorable tracks on the album. “Cut… Lacerate” plays with a crisp sounding break and a tight bass synth as the driving force for the song. About five minutes in, a heavy kick gets added in and turns the remaining three minutes of the song into a big beat, techno type track that could have come from Fluke. It takes a little bit to get to the better half of the song, but it’s not much of a chore to get there and the payoff is worth it. “Nightbreed” is the most rock-oriented song on the album and ends up being the hardest to listen to. During most of the song, there is a nice chugging guitar line that plays nicely with the synths, drums, and vocals. Taken by itself it sounds fine, but when the chorus hits, it actually feels like a pre-chorus that is building up to something that never pays off, leaving the listener wanting more, but not in a good way. “Chosen” starts off sounding like a cousin to Darker’s “Silent Voices,” leading with minimal atmospheric sounds. Lyrically, it sounds like the beginning of the relationship that ended with “She Left,” opening with “The day she came, I was unprepared.” About halfway through the song, it stops being minimalist and becomes a full on electronic ballad, mirroring the way Darker originally ended with “Epitaph” with a big, uplifting sound that wouldn’t have been a bad way to end the album proper. But there are two extra tracks after that, the first of which is the French lyric version of “She Left.” De Meyer’s vocal delivery can be just as clipped as it is in English and the song loses nothing in the translation, leaving the 2018 reissue to finish out with “Until We Disappear,” which as a previously unreleased track still feels a bit incomplete with no real hook. In many ways, Cut is an improvement on Darker – the production is cleaner and has a more modern sheen, such that it could have been made this year. And the palette of sound is more consistent, making it a more cohesive album. But it also feels like it plays it, if not safe, at least safer, leaning more toward traditional industrial sounds and beats… but a really solid version of those sounds, to be sure. Overall, Darker feels like the better album as it takes more chances and has a more unique feel to it, even if the sound quality isn’t always there. Cut is definitely a better sounding album and great in its own right, but it also feels more like an extension of Cubanate, sharing many of the same sounds and beats. 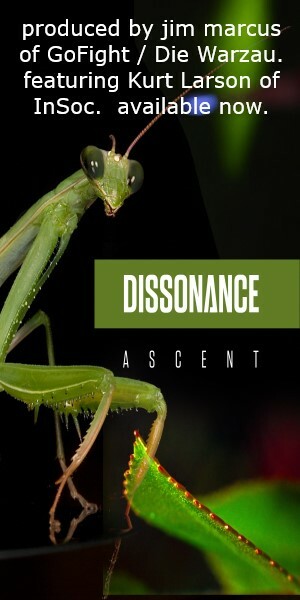 But both albums are well worth the time, especially for fans of Marc Heal and Jean-Luc De Meyer, along with the exceptional remastering of Jules Seifert and the new cover art by the inimitable Jim Marcus, recapturing the singular essence of the original covers with a modern touch. C-Tec sits in a special spot in the history industrial music where a side project got it right, not just once, but twice.